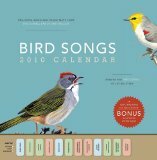 I read a posting on GetLoFi.com, one of my favorite circuit bending sites, about bending the Bird Songs 2009 Wall Calendar. Creme DeMentia got some amazing sounds out of the birds, so I had to try my hand at bending it. I jumped right on Amazon and bought one for five bucks. I tore it down as soon as it arrived, but it took me a couple of months to get around to bending it. Check out this video to hear the weird and wonderful sounds that are possible by bending bird songs. 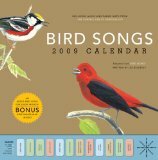 It is a regular wall calendar on top that features one bird per month. At the bottom is a strip of buttons that, when pressed, play the sound of each of the birds. Tearing it apart revealed that there is a speaker on the far right, a pressure switch strip in the middle, and a little circuit board on the left. There is also a battery compartment that holds three watch batteries. Everything is held together with tiny screws and comes apart easily when they are removed. The pressure switches are a plastic film that terminates in a row of contacts which are pressed against a row of contacts on the circuit board. The switch setup is very simple. Connect one of the 12 contacts to a common contact to play the sound. There is a surface mounted timing resistor on the board that controls the speed of playback and, therefore, the pitch of the sounds. After playing with it, I decided what I would do. I wanted to be able to hook it up to an amp or effects box, select a sound, trigger or re-trigger the sound easily and control the pitch. I also wanted to be able to control it with my Bender Sequencer. Click on the picture for a full-sized, non-annotated version. A The speaker wires run from the bird board to jack H.
B The bird board itself, which is mounted using two of the mounting screws that had held it in the calendar. C This is where the timing resistor was surface mounted. There are two wires soldered in its place and connected to terminals J and pot K.
D Battery wires, which connect to the battery compartment from the calendar, which is chopped down and glued to the underside of the protoboard. E The contact points for the 12 bird sound switches. I really wish they were on .1" centers, but they are metric. There is a little wire soldered to each contact and to the copper strips on the protoboard. F A switch connects the selected contact point to the common. Press this to play a bird sound. A nice thing about the bird board is that if you press the switch while a sound is playing, it restarts. That is really key because some of the bird songs are rather long. G The contact points are connected to two rows of six headers. The other side of the header is connected to a common copper strip on the protoboard. The current sound is selected using a jumper which you can see in the picture on the fifth point from the right. I External connector for the trigger switch. I put this in so that I could trigger the sounds using my Sequencer. J External connector for the pitch resistor. This is also here for controlling the bird sounds from my Bender Sequencer. A regular CV (control voltage) sequencer will not work here. That is why I designed the Bender Sequencer. It has an optoisolated resistor output that can be used in place of any pot. K This is the pitch control potentiometer to bend the bird songs into new and unusual sounds. Everything is mounted on a RadioShack prototype board. I love those things and have been using them for years. This project certainly fits the dictionary definition of a circuit bent device. However, I wonder if purists would decry the fact that the original device was not left intact. Then again, a purist circuit bender is sort of an oxymoron. On Amazon, the 2009 calendar is down to $3.40, and the 2010 edition is only $4.00. Even if you are not interested in bending it, I highly recommend getting one to hang on your wall.